There is an abundance of options out there for charging mobile devices on the move, and the Re-fuel power bank from Digipower has a 5200mAh capacity and a 1A (5V) output rating. With a single USB port at one end and a Micro USB input port for charging purposes, it has a curved design and is finished with lime-coloured ends to make it easier to find when stowed away in a bag. On the top surface there’s a single button to start charging and check the remaining power of the lithium polymer battery, which is indicated by four tiny bright-white LEDs. Out of the box, I used the supplied Micro USB cable to fully charge it before testing it hooked up to my iPhone. Charging times are fairly brisk and it increased my iPhone’s battery life from 2% to 50% in just over an hour with power to spare. Although it can be used to charge a tablet, you’ll quickly find that it is underpowered in this respect. 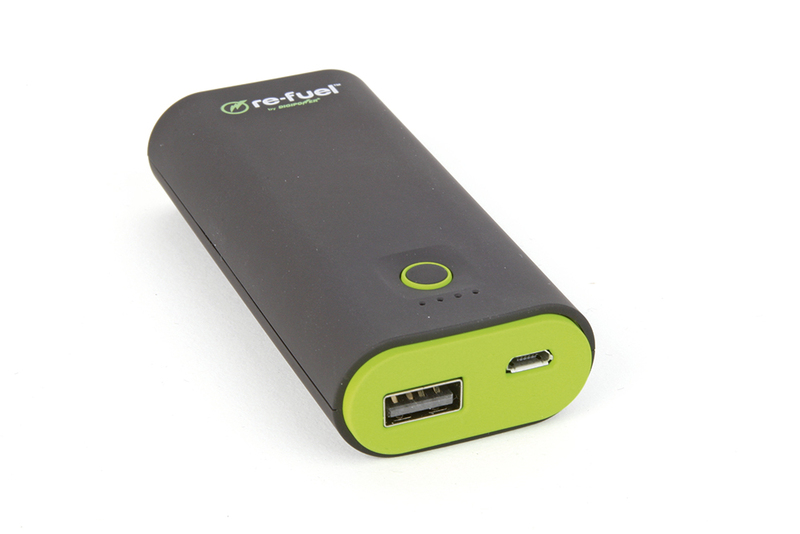 Overall, the Re-fuel by Digipower rechargeable power bank is a practical size and handy for when your smartphone runs low.